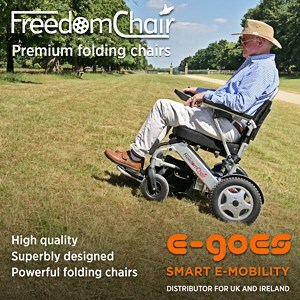 Gerald Simonds Healthcare, one of the UK’s most established retailers and distributors of manual and powered wheelchairs, add-on powerdrives and wheelchair seating systems, has been sold to the Borrum Healthcare Group. The Motability-accredited importer and distributor of principally high-end, custom-built manual wheelchairs has been in the market since 1983, being the first UK distributor of the original Swede 24 wheelchair – one of the first lightweight rigid framed wheelchairs in production. In a statement released by Gerald Simonds Healthcare, the company says the sale to Borrum was triggered by the retirement from active duties of founder Gerald Simonds, who has led the business since its inception. Established in November 2018, Borrum Healthcare Group Ltd is headed up by Richard Boys-Stones and Bob Darke, both Partners of management consultancy & strategic investor firm Borrum Partners. Following the acquisition, the new owners have indicated that the Aylesbury-based mobility provider is set for major growth, with Borrum stating it will now be bringing its resources to bear on growing Gerald Simond Healthcare’s existing business by increasing its geographic coverage. Well known in the market for its expertise in innovative lightweight manual, powered and standing wheelchairs, the new owners also plan to expand the company’s product offering, developing into new and complementary product areas as part of its growth strategy. Key figures Doug Robinson, Managing Director, and Tony Phillips, Financial Director of Gerald Simonds Healthcare, remain with the company, as do all other current personnel.